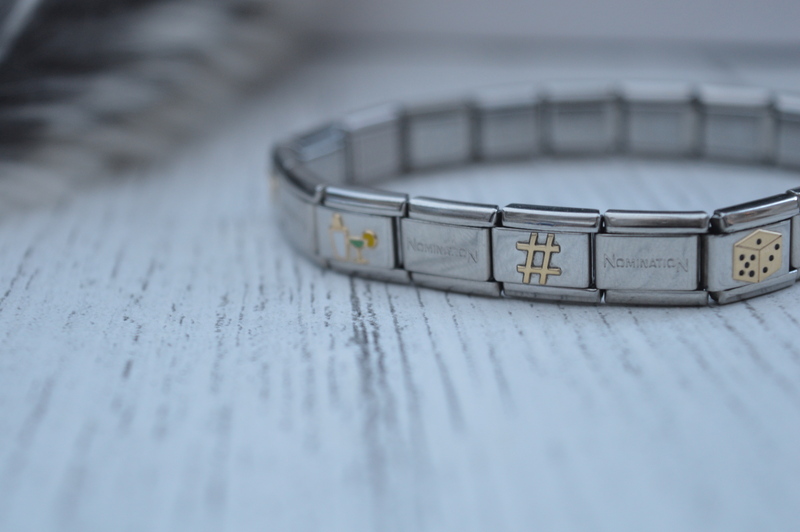 Charm bracelets over the last few years have made a resurgence in popularity. 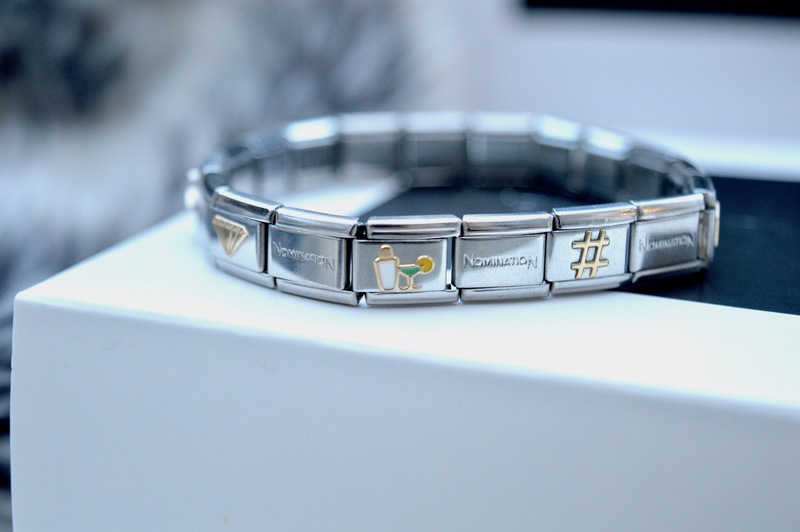 With it now being the in vogue cross-generational collectable. 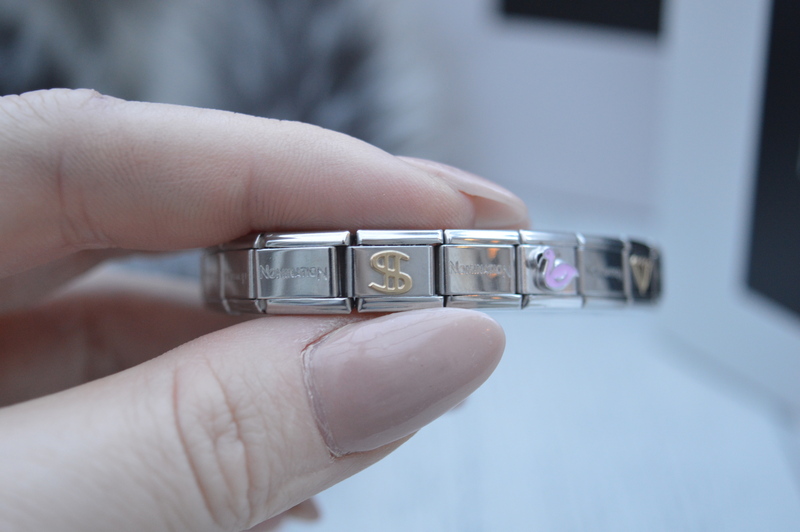 These customisable bracelets, personalised to individuals tastes and sentimental memories means that technically no two bracelets would be the same. 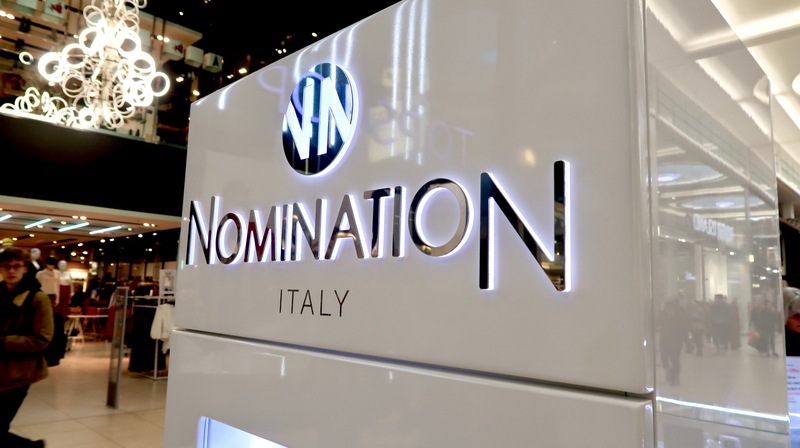 With Nomination, the Italian brand being one of the go-to jewellery designers for an array of charms. 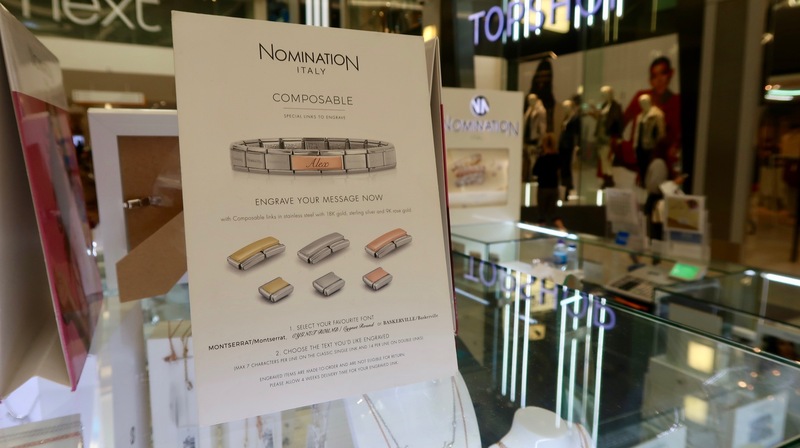 We recently took a trip to the Nomination concession in the new part of intu’s Eldon Square to create our very own customisable bracelet. The stand is located directly in the centre of the mall and perfectly accessible. Meaning if you’re looking for a gift for a loved one the stand jumps out at you with its large signage and bright lights beckoning you alluringly to the hundreds of different options. 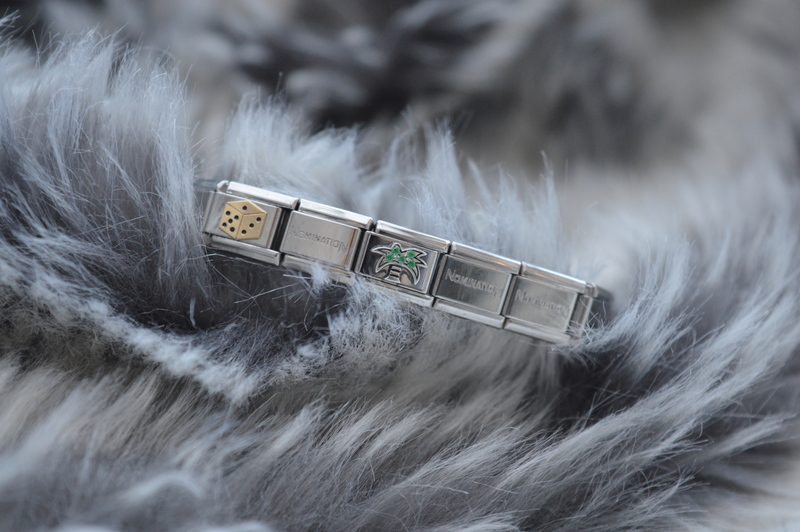 What I love about Nomination bracelets, which are unlike other charm bracelets as they’re dainty with the option to have nothing dangling down. 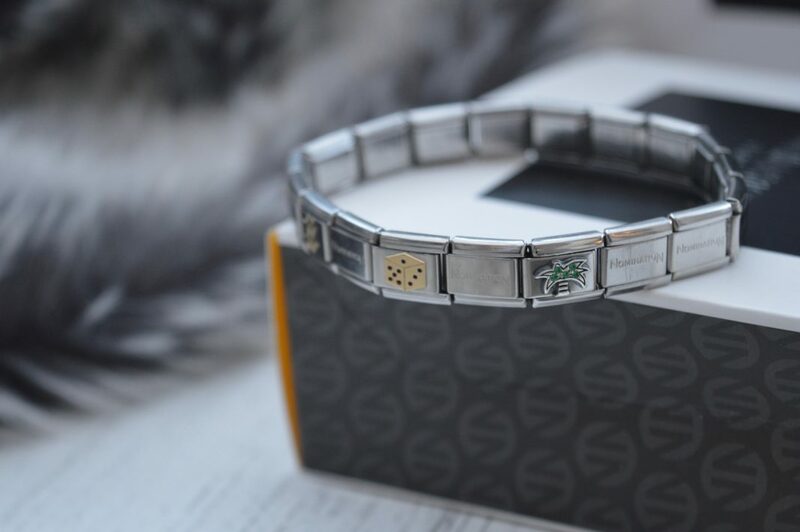 Which for me is great as I get frustrated with the constant jangling on my wrist. Arriving at the stand, one of the Nomination angels, Christine helped us with the whole process. She talked us through the different selections. Talking us through the whole charm collection. There are gold, silver and rose gold charms to go for. 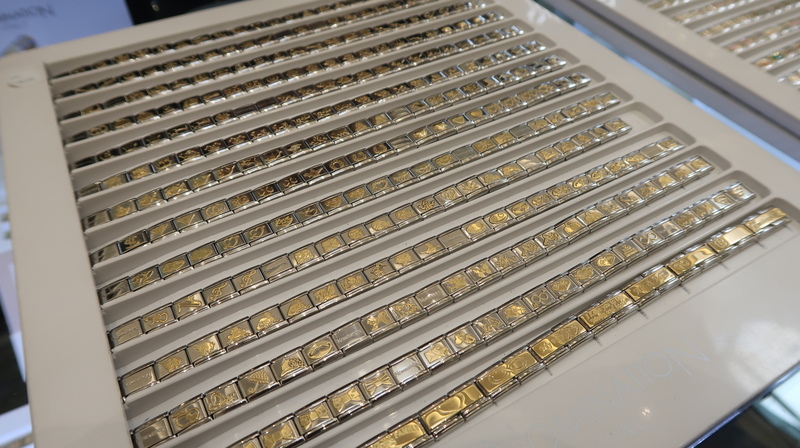 The gold collection is the largest collection of the three. Whilst many people select their charms from one colour selection, I decided to mix mine up. Pretty much sums me up. A bit of a mix-up. Now let’s be honest. Some of the charms are not going to be to your taste, but some of them will evoke memories of travel to your favourite places. They may evoke memories of family members, even pets. There’ll be some to signify important life events; from big birthdays to weddings. Baptisms to graduations, Nomination covers them all. There are unicorns and star signs, even important information, such as blood type. Nomination are constantly including new charms all the time and there are talks of location-specific charms being released for Newcastle. 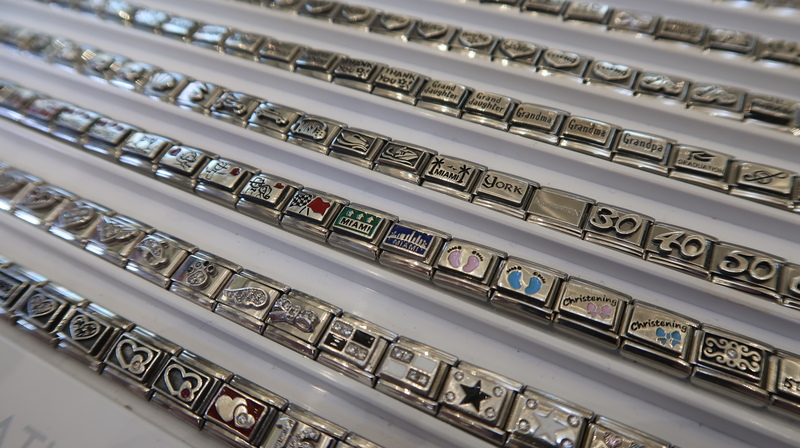 There are already York specific charms for those of you visiting the York store. You’re wondering which charms we went for right? We already know how Vegas obsessed we are here so of course, this was always going to play a huge influence on our collection. First up, the ‘$’ charm. We selected this charm simply because the USA is our favourite place to travel to. We’ve had some fabulous holidays not just in Vegas but in San Francisco, Boston, star spotting in LA and New York (which we’re heading back to at the end of next month). 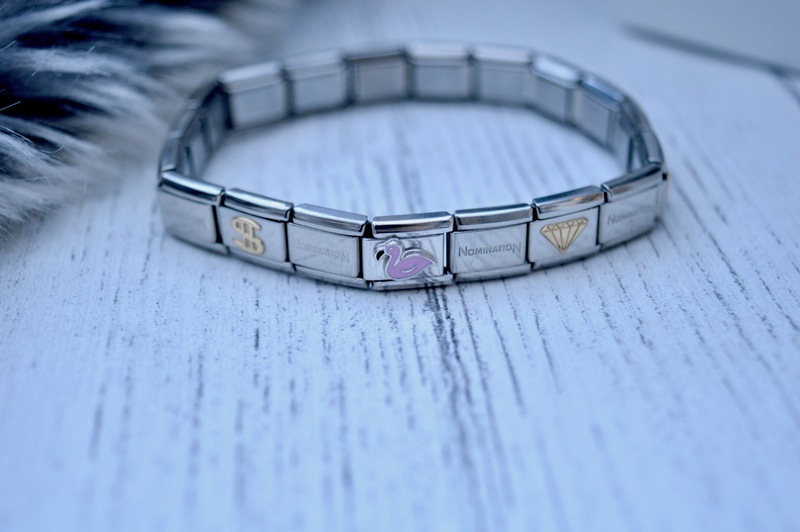 The next charm we chose was the enamel pink flamingo. Flamingos are very popular at the moment, however, the flamingo holds a special memory of our last trip to Vegas, where we stayed in the hotel of the same name. Ended up getting upgraded to the penthouse suite floor and had a room next to Donny & Marie Osmond. Looking down at a flamingo on my wrist really makes me smile and think of this time. A gold diamond was the third charm selected. 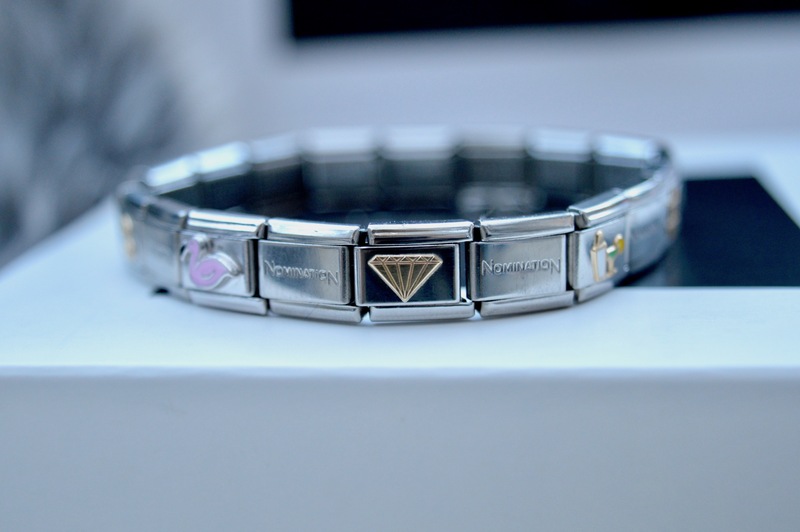 We chose this not only because diamonds are a girl’s best friend but as a reminder that no matter how much pressure you’re put under, a diamond is just coal that did really well under pressure too. It’s one of our mantras in life and a reason why we use the diamond as our branding emblem. The fourth charm; a cocktail shaker and cocktail in enamel. Well, …it’s five o’clock somewhere right? No great story started by eating salad did it? All of our favourite memories are always cocktail induced so we felt that this was only right to include a nod to being fans of a delicious cocktail. Next up, and a one you’ll think I’m mad at choosing (if you don’t already think I’m crazy) is the ‘#’ charm. Having built my businesses solely online and having such a love for Instagram, it’s a nod to my chosen career path and how much I love social media and the internet. It’s a tribute to all the magical adventures that both this website and my Instagram have brought me to. The penultimate charm, a gold die. Because no Vegas lover would be complete without some lucky dice in their life! Let’s just hope it brings all the riches the next time we visit Sin City. Finally, the jewelled palm tree. With a love of travel and warmer, sunnier climates and a love of sparkle this cute little palm completed the lineup. Looking down at this charm makes us happy in the knowledge that our next vacation is on the horizon. With 12 more spaces for charms, we are looking forward to making more memories and remembering them with Nomination charms. 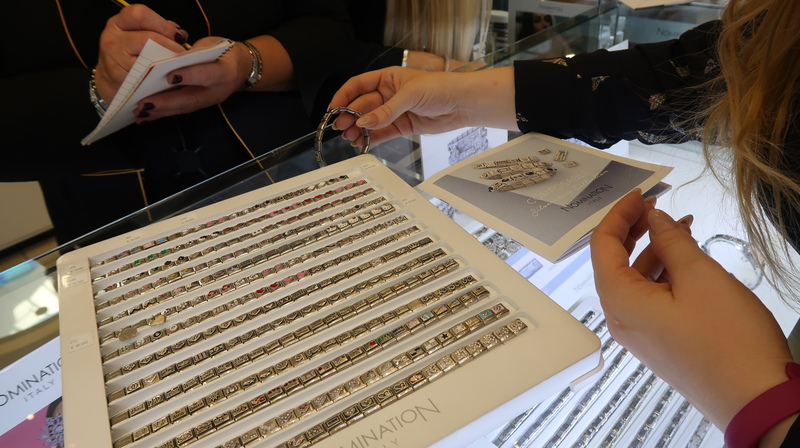 Having loved our visit to the Nomination store in Newcastle to see all of the charms in real life. As often the images online don’t do them enough justice we too think that you should head to the stall to check out which charms you’d pick! 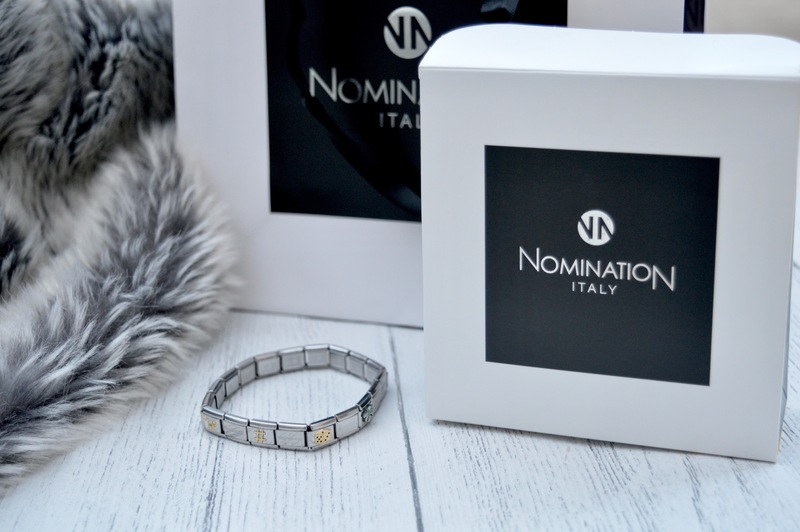 Nomination has an offer on currently if you spend £35 on charms you get the base bracelet free. This offer runs until 28th October so be quick! Find out where your nearest Nomination is here. Sponsored Post. All views are our own. Read more about disclosure here.